FAT32 and NTFS are the files systems used in an operating system. NTFS is the successor of the FAT32 which is used in newer versions of operating systems such as Windows NT and 2000 and its later versions while FAT32 is the oldest version of the file systems and used in earlier versions of the operating system such as DOS and Windows version before XP. The prior difference between FAT32 and NTFS is that NTFS file system can trace the changes committed in the system with the help of maintaining the journal whereas this is not the case in FAT32, even though FAT32 is still used in removable media and storage drive. Additionally, NTFS supports large file and volume size and provide efficient data organization. Now, what is a file system? It is a technique of organizing and storing the data on the drive, it also specifies what type of attributes can be attached to a file such as filenames, permission, other attributes. Journaling and channel log Absent Offers journaling to keep track of previous operations. Compression No provision of compression. Support file compression. As mentioned above the FAT32 is the oldest file system developed in the 1970’s available for Windows operating system. It was essentially devised for the floppy drive having a size less than 500 K. There are three versions of FAT – FAT12, FAT16 and FAT32 and they differ in the size of the file and structure on the disk. The FAT file system was first used in MS-DOS where the maximum size of the hard drive can be 32 MB consisting sectors of 512 K partitions. It is commonly used in removable drives and storage devices. The maximum size of a file in the FAT32 drive cannot be exceeded more than 4 GB and the partitions made in FAT32 should be smaller than 8 TB. The major demerit of using FAT32 is that it does not provide any security. The FAT16 previous version of FAT file system suffers from the internal fragmentation and lacks the access protection for the file. The FAT32 file system uses a linked allocation which stores the control data separately from the file system. A File allocation table of a disk contains an element for every disk block in the disk in an array. The disk block assigned to a file, the associated FAT component holds the address of the next disk block. Therefore, the disk block and its FAT element collaboratively form a unit that contains the same information as the disk block in the form of linked allocation. The directory entry of a file holds the address of its first disk block and the FAT element corresponding to this disk block contain the address of second disk block and so on. The last disk block FAT element includes the special code to signify the end of the file. NTFS is the latter version of file system devised in the late 1990’s for windows system drive and removable drives. The NTFS was created with the intent of removing the limitations of the FAT file systems. It includes characteristics such as data recovery, multi-streaming, fault tolerance, security, extended file size and file systems, UNICODE names. NTFS maintains a journal which keeps track of the operations performed in the drive and can quickly recover the errors, shadow copies for backup, encryption, disk quota limits and hard links. NTFS supports greater file size and drive volume as compared to FAT32. It prevents unauthorised access to file contents by enforcing an encryption system named as Encryption File System which uses public key security. The NTFS file system does not rely on the sector sizes on the different disks. It uses a concept of the clusters and cluster is a group of contiguous sectors for the disk space allocation. The cluster could contain 2n number of sectors. A logical partition on the disk is known as volume and it utilizes a bitmap file to signify the allocated and vacant clusters in the volume. There is also file named as bad cluster file to keep the record of unusable clusters. A volume set provides a way to exceed the capacity of the partitions which is up to 32 volumes. The NTFS volume is comprised of the master file table (MFT), boot sector, and some user and system files. Master file table resembles a FAT table and includes all the details about the files and folders on the volume. The existence of the boot sector makes every volume bootable. 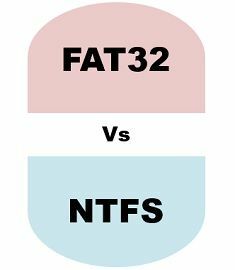 The FAT32 is simple while the NTFS structure is quite complicated. NTFS can support larger file and volume sizes along with large file names relative to the FAT32 file system. FAT32 does not provide encryption and much security whereas NTFS is enabled with security and encryption. It is quite easy to convert a FAT file system into another without losing data. In contrast, NTFS conversion is difficult to achieve. NTFS performance is comparatively better than FAT32 as it also provides fault tolerance. The files are accessed faster in the case of NTFS. On the contrary, FAT32 is slower than NTFS. NTFS impart features like journaling and compression, which is not provided by FAT32. Efficiently work under partitions of 200 MB. Provides compatibility with different operating systems and frequently used as the primary partition on multiboot systems. Perform well even in the partitions over 400 MB. File and directory structure improves performance. The partitions over 200 MB can degrade the performance. Directory structure does not have any standard organization. NTFS is not pervasively supported. Performance degrades under partitions of 400 MB which means when the small volumes contain small files the overhead can be generated. Between FAT32 and NTFS File systems, the NTFS file system is newer technology which provides more features as compared to FAT32 such as reliability, security and access control, storage efficiency, enhanced size and name of the file. Even though, the FAT32 is still in use because of its compatibility.